Next post: Playing with marmalade, indigo, satellites, and robots! I’ve been feeling pretty frustrated the last few weeks, as I’ve been doing Lots of Stuff but not actually getting anything done on my big projects! So I spent some time thinking about it, and concluded that the problem was too many projects. In particular, I have the book and Phoenix Rising to deal with, plus the color study and a collection of other minor projects. I really want to finish the book, or at least the rewritten book proposal. And I can’t hold two major projects in my head at once. So I am putting Phoenix Rising on hold until the book proposal is ready. That will be a few months, at least. I need to focus. I managed to score some bergamots and some Rangpur limes – both quite difficult to find! 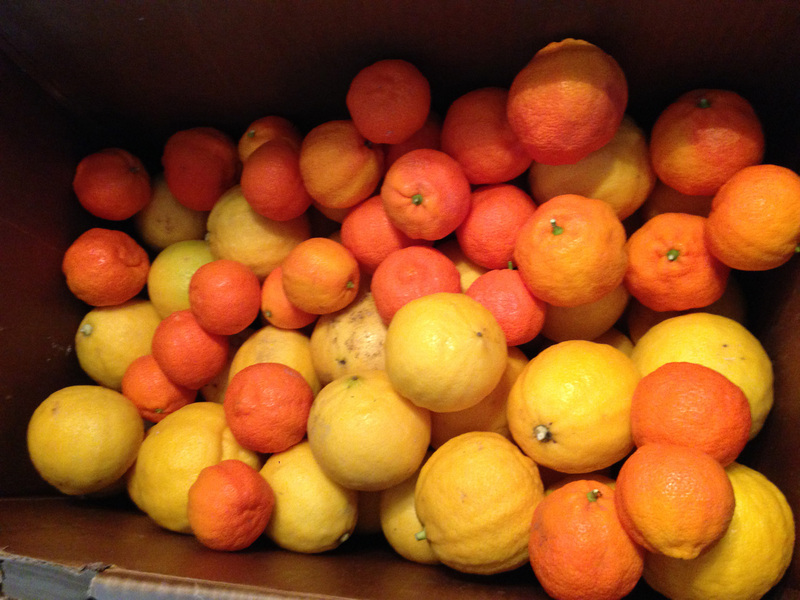 – so I will be making marmalade this weekend. The plan is to make bergamot marmalade, Rangpur lime marmalade, pink grapefruit marmalade with rose geranium, and (possibly) Meyer lemon and strawberry marmalade with rose geranium. More likely I will only make the first three – it depends on my enthusiasm after the first few batches. They are HUGE – the quarter is to give a sense of scale. 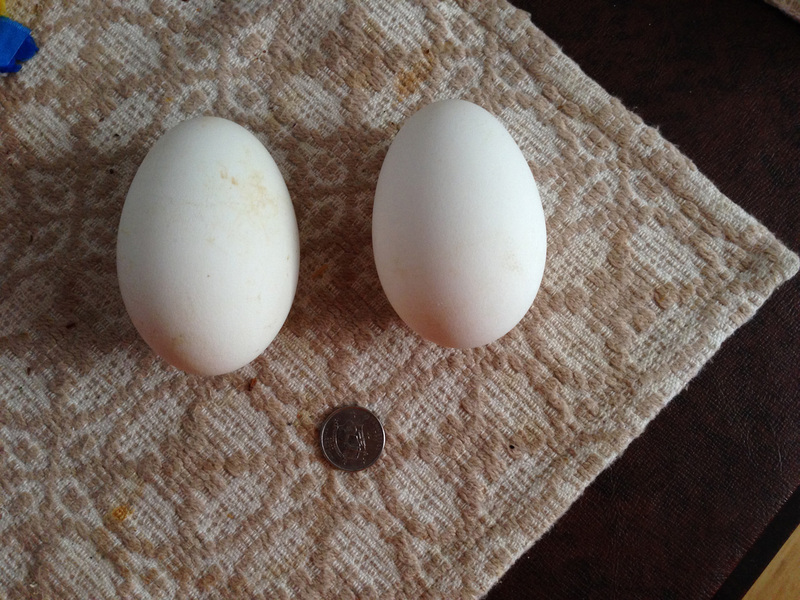 (I should have used a chicken egg to show just how huge they are!) It’s a pity I’m not doing egg art anymore – these would be perfect. But mostly I’m just curious what goose eggs taste like. I’ve had chicken eggs, quail eggs, duck eggs, and even emu eggs – but never goose eggs. So this will be interesting. However, it’s a two-shuttle weave. I’m currently trying to turn the draft, which would make it a one-shuttle weave. But I’ve run into some snags. It’s going to take some concentrated thought to understand this, I think. I understand how to turn a normal two-tie weave, but a tied weave with a networked six-shaft set of ties on a three-end initial? Not so much. But it is a delightful challenge; I’ll probably spend another few mornings working it out. If you’ve done such a thing, please drop me a line! It would save me a lot of time if I could chat with someone experienced in such things. 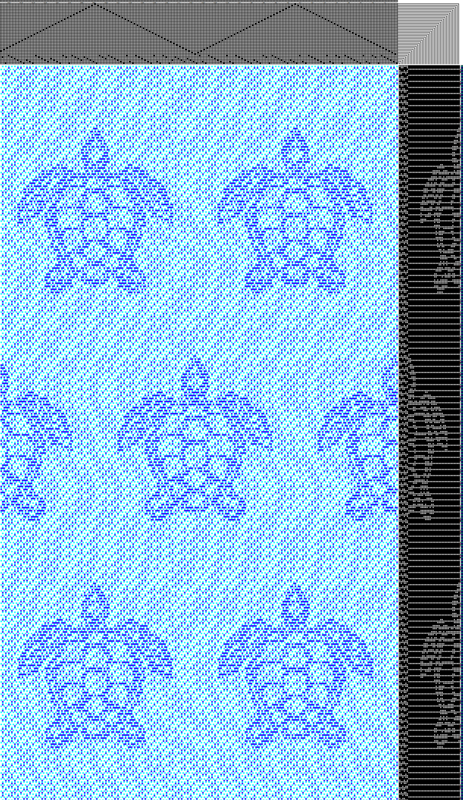 The nice part about the sea-turtle warp is that it would also work very nicely with phoenixes. So if I turn it, I’ll likely paint both the pattern and ground warps, one section in blues and greens and one in reds and oranges, so I can weave both turtles and phoenixes. And, finally, I’m planning to do a small indigo vat this weekend, helping out a friend who needs to do some indigo dyeing. I haven’t attempted an indigo vat in at least a decade or two, so this should be interesting! But to make life simpler, I’ve ordered some pre-reduced indigo crystals from Dharma Trading Company. We’ll probably try that this Saturday. I’m really tempted to try some shibori dyeing as well. But maybe not – that would occupy the rest of the week, and I actually do want to spend some time on the book. I’m deep into one of my sample chapters (the one on visual design) and want to finish the rough draft this week. 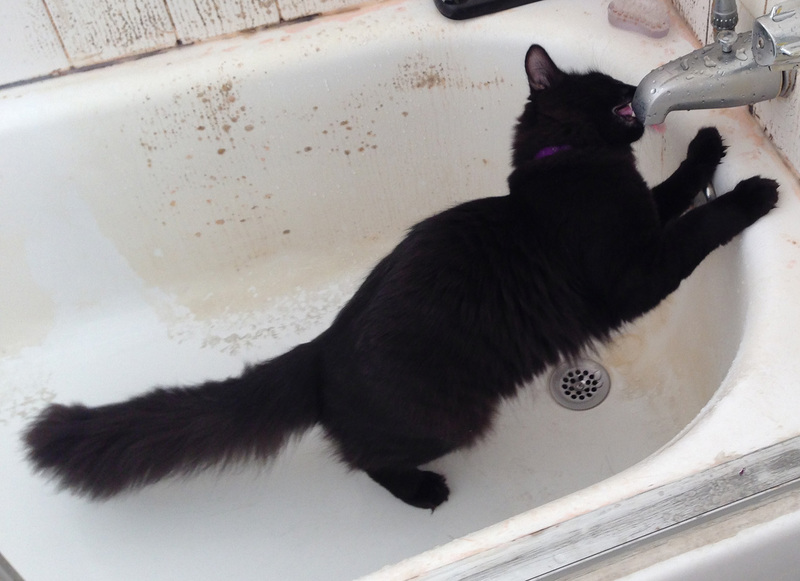 And, for those patient enough to follow through to the end, here is Fritz making a new discovery: the joy of drinking from a dripping faucet! As soon as I step into the bathroom, he comes running down the hall, hoping I’ll turn on the sink faucet for him. And I usually do. Fritz is too clever and cute. Glad you are working on the book and my mind can’t even begin to absorb your multi-shaft weavings, but I read on…….Snowing a little today and 32 degrees. Depending on what the geese have been fed, their eggs can sometimes be a bit strong, but the last ones we had deep in the wilds of northern Scotland were mild and delicious, and very filling. Hi! tried to email you after the Ft. Collins show, and the message was returned. So nice meeting and talking with you. I see you, too, have a ‘water’ cat! !